When I first got heavily involved with science fiction and fantasy fandom, I was surprised at how frequently I saw knitting going on at conventions and other geek events — which only showed how little I knew, as geekdom and knitdom always has significant overlap, and that overlap has only grown over time. 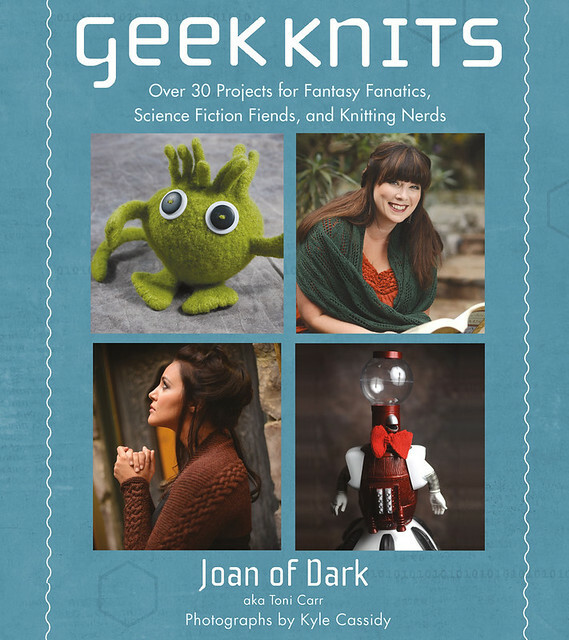 Now Joan of Dark (aka Toni Carr) has brought together the two in book form with Geek Knits, which features nifty knit projects for crafters, modeled by geek notables and celebs in photos by Kyle Cassidy (disclosure: I and Krissy are featured in the book). Here’s Joan to explain how the book got crafted in the first place. “You know what would be cool?” I tend to say that sometimes to people, and miraculously, sometimes they listen. (This is why there is a roller derby knitting book in the world) I think the first time I uttered those words about Geek Knits was after a visit with Neil Gaiman, when he wore the softest, blackest angora sweater that a friend of his had made for him. As my companions and I were heading home I said, “You know what would be cool? A knitting book with novel writers and scientists and comic writers and you know, GEEKS wearing knit stuff. Really good photos too. A knitting book that could almost double as a coffee table book. That would be really cool.” I mused on it a little bit, mentioned it to friends, and tried to let the idea go while I worked on other projects. Then I hung out with photographer Kyle Cassidy a few times, and mentioned the idea to him. We started running over our dream list of geeks to photograph and what we would have them wear. Then we started talking seriously, who did we know? And the people we knew, who did they know? Could we make connections and make this happen? How could we do over 30 photographs in less than a year without having to fly to 30 different locations? This was madness. So naturally, I pitched it to my agent. She agreed. Wonderful, magical, madness. Let’s do this thing! Selling the idea of the book was the easy part. It’s difficult to narrow down an idea as broad as “Geek Stuff” when working on a pattern book. Should everything be cosplay, mostly unwearable in real life, and probably hard for the beginner or average knitter to complete? Or should everything be fairly simple, such as sweaters worn in the Harry Potter movies and scarves worn in Doctor Who? Or how about general geekiness like ties and pocket protectors? Obviously, part of the fun of making a book like this is making things that people want to recreate! Luckily, I realized that trying to please everyone is a quick path to the bad sort of madness. I decided the best thing to do was to design the patterns I wanted to design, and enlist the help of other designers to bring some dimension to the book. Which is how we came to have wonderful things like a stuffed Bunnicula Vampire Bunny (permission granted by James Howe to make him), an amazing sweater inspired by the question “What would Molly Weasley knit for Arthur?” and Cthulhu gloves. I wanted to bring my favorite ideas about knitwear to life. I love that knitting can be either average or absurd and no matter what, it is, it’s a work of art. A bit of string looped around some needles becomes a sweater! Sure, a sweater is a pretty basic piece of clothing, but to those who know the hours it takes to create one, it’s sort of an amazing concept. Then there’s the slightly absurd. Could I design a knit fez? Could I get my talented designer mother to create a snow beast balaclava inspired by the alien that scared me in Star Wars? These are things most people aren’t going to throw on when they run out to the grocery store, but they fall into the “so weird it’s wonderful” category for me. My initial idea, the “You know what would be cool?” concept of getting geek celebrities to do the modeling was almost as hard as the designs themselves. Writing to my heroes and asking if they would mind being a little silly, donning socks and hats and sweaters for my knitting book. Those were pretty tough emails to write. Luckily I have friends, and friends of friends who helped make connections. Even luckier, I realized that lots of celebrities don’t mind being silly. Paul and Storm serenading a stuffed worm comes to mind. I’m going to keep saying “You know what would be cool?” and working to bring those ideas to life. Because you know what? This project was really cool! Visit the author’s site. Follow her on Twitter. Visit the book’s Facebook page. damn, what a great idea! shared. My copy came yesterday, and already my home-from-college son has begun to compile a list of projects for me. The book includes projects at multiple skill levels, and some where the geekiness factor is pretty subtle, so the knitter/wearer can keep it to themselves like a secret that they can savor – I’m thinking of the Dr. Who scarf, the Poison Ivy shawl, and the Dragonrider shrug. Can’t wait to get those needles clicking! Hey, Kyle Cassidy! He’s the guy who did that great series of librarian portraits that was in Slate! Okay, so another book to put on the WishList! Please contact me whenever you get the book deal for Geek Knits 2! I designed a pattern for Welcome to Night Vale (Desert Bluffs, actually) that uh, I’d volunteer for the book :) This is also my Ravelry name so you could see it on there somewhere. Anyhoo, this sounds really cool, off to go take as much of an electronic look as I can….